Originally lunar based, the Roman calendar measured the Roman civic year. Its reorganisation by Julius Caesar made it the basis for the modern western calendar. 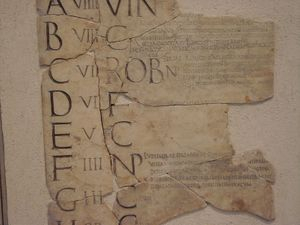 The Roman calendar or fasti began as a seasonal calendar but developed into a register of days for legal or public business. It was believed to have been introduced to Rome from Etruria, sometime before the fall of the Roman Kings. This supposition is based on the root of some of the month names, such as 'June', which derived from uni, the Etruscan spelling for the goddess Juno. The calendar underwent a major revision during the dictatorship of Julius Caesar who introduced the concept of the leap year, forming the basis for the modern western calendar. The original Roman calendar followed the seasons and was essentially lunar based. Each month had special named days that specifically corresponded to different phases of the moon. These were the calends, nones and ides. Calends: This was the day that marked the first appearance of lunar crescent after new moon. It survived as the first of the Roman month. Nones: Represented first quarter moon. It came to represent the seventh day of 31 day months and the 5th day of all others of shorter duration. The calendar became a ten month, solar orientated calendar briefly during the rule of Romulus, with the year running from March to December with the winter moths uncounted. It reverted to twelve months under the second king of Rome Numa Pompilius. By the republic, the calendar was being organised to suite the political year. Important historical dates were recorded not by the number of the year but the name of the consul in power at the time. The year itself was 355 days long. March, June, July and October were each 31 days long and all the rest were 29 days apart from February which only amounted to 23 or 24 days. In between was an intercalary month of around ten days which was designed to align the months with the electoral calendar. As a result, the calendar was out of line with the natural year. By the time of Julius Caesar, it ran three months ahead of the solar year. Caesar decided to reform the calendar to realign it with the seasons and used the Egyptian solar calendar as the basis. The year 46BC was lengthened to 445 days to bring it back into line and the new calendar was implemented on the first day of 45BC. This new calendar was known as the Fasti Antiates Maiores and was based on a 365 day year. The extra ten days were added to the shorter 29 day months and rather than adding a whole intercalary month each year, Caesar introduced the practice of adding one day between the 23rd and 24th February every fourth year. This meant that the 23rd occurred twice during what became known as the leap year. The Calendars of Augustus, Tiberius and Pope Gregory the Thirteeenth. Julius Caesar’s death saw the calendar again becoming subject to miscalculations until it was brought back into line by his heir, the emperor Augustus. He and the emperor Tiberius made minor changes to create what we know as the modern western calendar of today. The Julian calendar remained in place in the same essential form until 1582 when it was re organised again by Pope Gregory the thirteenth into what became known as the Gregorian calendar. Ovid’s Fasti (2000) trans and edited by A J Boyle and R D Woodard. Penguin Books: London.